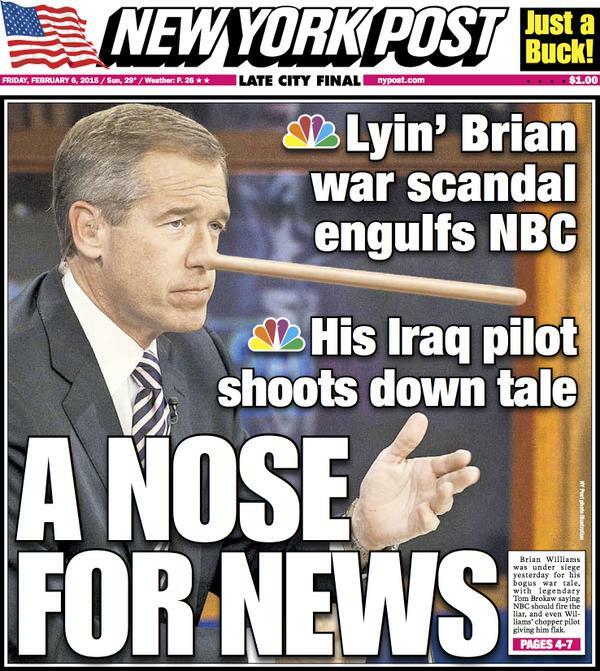 Today’s edition of the New York Post has a picture of Brian Williams with a Pinocchio nose. The general public is upset because they feel deceived and lied to by newscaster Brian Williams. We want to believe that these guys are given a platform like live television and that they are reporting the truth. When we learn otherwise we are upset and feel deceived. We proclaim to hate liars. Does everyone lie? Some people tell the small white lies, you know when they run around telling everyone how good they look or some other obvious flattering statement that can easily be viewed as a “white lie” or the whopping big lies? Most people don’t like to be lied too. I’ve heard it said so often; “there is nothing worse than a liar.” And yet so many people do it. I was recently having a conversation with a young adult in his twenties and when I confronted with what I thought was a lie his immediate response was, “everyone lies.” And then he abruptly ended the conversation. Does everyone lie? We want to believe that most people are honest and truthful but what happens when we learn for a fact that we have been deceived and lied to? How does that make us feel and why do we hate liars when it seems that many people do in fact lie. I think it is because we want to believe that everyone can be honest with us and yet many people have difficulty with the truth. Without trust there is no relationship. People lie for many reasons but often it points back to shame or fear. Some people lie because they are selfish and they are pathological in the lies, they lie even when it would be easier to tell the truth. When we are faced with a lie, we feel disrespected and unimportant and often we feel like a fool for having believed the lie. The best thing to do to redeem yourself is to confess and accept the consequences, don’t expect the relationship to be the same and if you truly want to make it better don’t lie anymore. For me I get upset because I don’t think you can ever really be close to someone who is a liar. When we can’t trust people whether it is a friend or a family member there is distance that is created by their lies. We used to have someone in our life that was a well- documented liar. She did it where ever she went; she lied on the job, with her friends and with her family. It didn’t just happen once but was routine with this person and it wasn’t little white lies either. They were really skilled liars and when I say that I mean you really wanted to believe them and they were passionate about their lies, held on to the lie until you literally went through the entire process of uncovering the truth. This person never seemed to have any heart or any conscience about the depth of their lies either. In the end we knew that we could never trust them and that we could never be close to them. Hard as we tried their constant lies both big and small was a deal breaker for us. We just couldn’t make it better or make it right. Their commitment to their lies was stronger than any love they had, if in fact they ever had any love at all. Brian Williams may be deemed less effective on the job now that it has been disclosed that he lied. Remember Nixon and Watergate, his lies and the ultimate cover up cost him his job as the President. Then Bill Clinton and his lies and deception, it happens from the top down and the bottom up. I have known liars and often I just shook my head. I might not have confronted the lie but it was a ding in the character of the person disclosed to me as a liar. Thank you Bernadette! I was married to a pathological liar (self admitted) diagnosed NPD and BPD. 35 Years and seven children. Our family has been torn apart by his lies. Five of my seven children believed the years of subtle but convincing lies about me. Thus I am eight years into an estrangment that seems as though it will never end. I read about how you handled your estrangement and I cannot tell you how much I admire you as well as use your words as a guide for my own life. Bless you. Bernadette, It is particularly heartbreaking when you have a child who lies pathologically. I know this from experience. Your husband is truly fortunate to have your support. One of my seven children died and I thought that was the ultimate agony. However, the pain of estrangement is close. We are deeply grieving their loss but the rejection adds salt to the wound. Thank you for giving all of us estranged moms and dads such validation with your inspiring words. It is much needed!